This gentleman has lived near my mother's house for as long as I can remember. We would always catch him walking by on his way home. 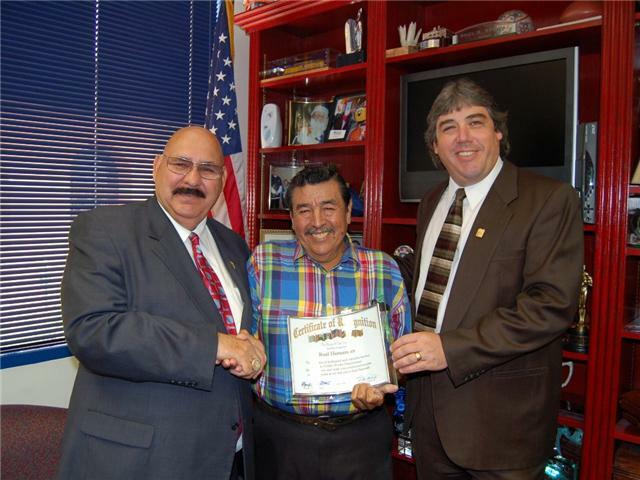 He was recently honored for his 39 years of service to the City of Laredo Public Works Division. Mr. Hernandez is now retired. “The longevity of your tenure highlights the character, integrity and hard work that must be your strength, to have served your fellow citizens in such an important job,” said Salinas. “I am so proud to honor your work like this and only hope that you can serve as an example to your co-workers and all City of Laredo employees about getting the job done,” he concluded. Hernandez started working with the City of Laredo with the Street Department (as the Public Works Division was known back in 1971), where he did everything from garbage collection to pot patching, paving, assisting with construction crews, including the night shift for the downtown crew. According to Ofila, Hernandez worked on many projects and was great asset to the city, always willing to help. “Roel, or ‘La Pancha,’ as he was known to his co-workers, was never late to work and never missed, even though he walked three miles to work every day of this life. As a heavy equipment operator, he was always willing to learn and never said no to anything. He was a great example of a great employee, everybody enjoyed working with him. Hernandez saw the Public Works Division develop and become what it it is today, handling many major projects for the City of Laredo,” concluded Orfila.